The UK has seen the number of rental households grow by one million since 2009, as renting increasingly becomes the tenure of choice for residents. Around 3.9 million households now rent in England and Wales, according to a new report from agents CBRE. To date, the growth in the supply of rented homes has been facilitated by buy to let investors, and owners from overseas, note the agents, with little interest shown on the part of institutional investors. Most of those foreign buyers have been focused on the greater London area, or on established rental markets in major towns such as those which provide homes for workers commuting into London. As existing stock becomes harder to obtain, investors are turning their attentions to other parts of the UK, say CBRE, prepared to consider diversifying risk by buying to let in other locations around the country. A combination of tough times for those in work, with many people not getting automatic inflation-linked pay rises; and a growth in demand from those buying properties for rent; has meant capital growth has beaten rental growth in all regions during the last year. The resulting yield compression is likely to continue through 2014, suggest CBRE, despite more new build housing being delivered to the market. “The robust performance of the private rental market in London, which continues to witness the strongest growth, has mostly been supported by employment growth in the business and financial sectors, affordability constraints and a lack of available mortgage products on the market,” said Jennet Siebrits, head of residential research at CBRE. Pensioners the new buy to let investors? Changes in pension rules announced in the recent UK Budget will give retirees greater flexibility about what to do with their pension pot. From April 2015, the over 55s will be able to access more of their pension immediately, and choose how to spend or invest it in a wider variety of options. While media attention has focused on the potential for grannies to go and buy a Lamborghini with their pension money, in place of an annuity, there are plenty of others who are expecting – or at least hoping – that the funds will make their way into property investment. The buy to let market could be one beneficiary. “Many agents and mortgage brokers believe people will increasingly turn to buy to let to provide income in later life,” says Letting Agent Today in a recent article. However, that does concern some in the property industry, who note that the property agency world remains essentially unregulated – meaning retirees could be easily persuaded to invest in a poorly performing asset, by unscrupulous agents. Buy to let mortgage provider Paragon Mortgages believes the chancellor could go further in his reforms. It wants SIPPS – self-invested personal pensions – to be allowed to hold residential property within them. The firm’s managing director John Heron told Money Marketing: “Private rented property is a popular choice for private investors and could sit well in a personal pension arrangement because it generates a flow of income, has strong defensive qualities and has an excellent track record for producing good returns. For one upcoming politician, with a specific housing problem of his own to solve, the latest Budget changes provide a perfect opportunity to keep the London housing bubble inflated. The capital’s mayor Boris Johnson calls the changes a “wonderful opportunity” that will invigorate bank of mum and dad – or even, bank of gran and grandad. And in his mind, that opportunity is for retirees to “find that sudden wodge of dosh that will enable them to help their children or grandchildren find a deposit”. This is great news, says Boris, because the new funds coming into the market “will give developers even greater confidence to build more homes – and faster than they are now.” So hope there that another government policy will continue to stimulate the UK housing market – for better or, probably, for worse. You can read Boris’s thoughts in full in his Telegraph column here. A shortage of homes has the potential to snuff out London’s economic growth. Unless the issue is tackled, and provision made for more rented homes and other forms of tenure, then the shortfall could cost the London economy a consequential loss of £85 billion by 2025. That’s the stark warning from a new report into the capital’s housing market by professor Michael Ball of Henley Business School. His research, sponsored by rental landlord Get Living London, uncovered a range of interesting facts about the market, and lays out some uncomfortable truths for policy makers. “Private market housing shortages are not simply an issue for those wanting to live in London but a major economic problem that should be of national concern,” warns the report in its executive summary. London’s booming economy needs more homes, of the right types, to encourage the bright young people who will drive economic growth. A quarter of Londoners now rent, including a “core group of highly skilled, affluent renters who help drive the London economy”. Inadequate housing provision could ultimately put people off coming to live and work in London – with employers moving from the capital if the situation gets bad, and they cannot attract the right skilled labour. A radical change in housing supply is needed, insists the professor in his report summary. “Bringing together the themes of the core renters in London, the Capital’s housing shortage and its economic prospects has thrown up some very striking findings,” said prof Ball. And Get Living’s chief executive Derek Gorman commented: “London is the economic powerhouse of the UK, attracting trade and talent from around the world but it is widely acknowledged there is a serious shortage of homes in the capital. 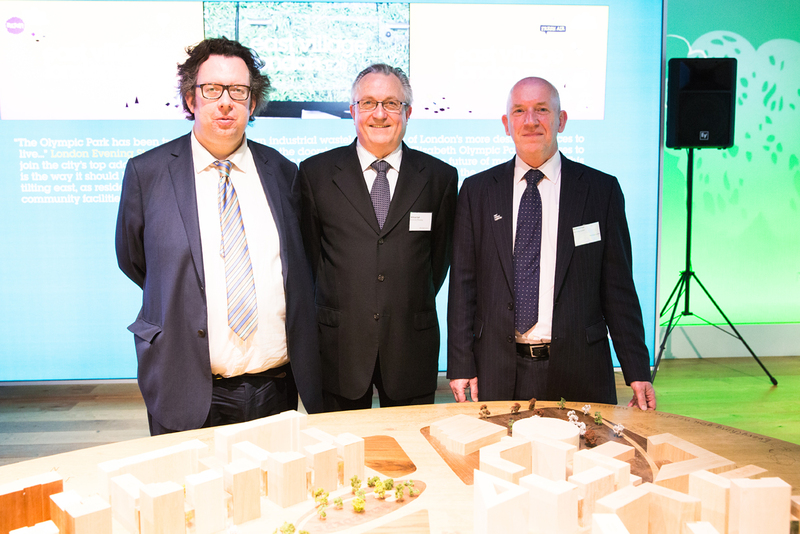 Richard Blakeway, professor Michael Ball and Get Living London’s Derek Gorman. Get Living London is doing its bit to help. The company has 1,439 new private homes for rent at East Village, the former athlete’s village at the 2012 Olympics venue in Stratford. The homes, offering from one to four bedrooms, are being released following a post-Olympics refit, and at the end of February, the one hundredth new resident moved in. Resimarketnews will be reporting further on the findings of the report. Meantime, if you would like a copy of the report, it is available directly from the Get Living London website. Grand City Properties, a residential landlord in the German market, has just published its results for 2013, giving a fascinating insight into the potential for institutional investors, if they get involved in buying and renting homes. Could we see an equivalent of Grand City in the UK market, in just a few years? Grand City finished 2013 with 26,000 homes in its portfolio, and recorded rental income of just under EUR100 million, with profits on the rise. The company is listed on the stock market, and investors appreciate its approach, sending the shares on a positive trajectory through the last two years. The company is backed by a selection of German and other European banks, and has already in 2014 bought a further 2,000 units to add to its portfolio. Rather than just being a passive landlord, Grand City actively manages its portfolio, buying into run-down assets and improving them. Its “stabilised” properties have less than 5% vacancy rates, while it buys into “turnaround” properties with typically more than 15% of empty units. It aims to hold 90% of the properties it acquires, for the long term. Part of the group’s strategy is “to provide a high quality service to tenants with the objective to minimise tenant churn”. It spends on surrounding gardens, children’s playgrounds and sporting facilities, to enhance the attractiveness of properties. Investors standing on the side and looking at residential rental property will find “their concerns are well-founded, but they are also often overdone”. That’s the view of Alex Greaves, a fund manager at M&G Real Estate, who is keen to spread the word about the sector, which he is currently investing in. M&G is acquiring build to rent housing across the UK, and in an opinion piece published recently by Property Week, Greaves says many institutional investors are missing out, prejudiced by outdated thinking. They “fret about residential’s higher operating and management costs, as well as the shorter leases,” he says. But ignoring the private rented sector means missing out on a positive story. Recent figures from the Investment Property Databank show residential rental property returned a total 14.7% return in 2013, with a six year performance of 10.7% beating such alternative investments as commercial property and government bonds. voids, reletting and repairs are easier if you own the whole block. And there are considerable economies of scale that kick in, such as hiring a direct maintenance team, buying fittings and hardware in bulk, and customising the design to suit renters. Energy efficiency measures start to pay back for both landlord and resident, and M&G has already seen the benefit of such measures across its retail investments; experience it is keen to migrate to the residential sector. You can also then add in items that make your offering considerably more attractive to tenants, such as communal facilities, cycle storage, help with moving in and so on. Greaves reckons these start to work, once you have at least £1.75m of rental income a year. The consequences of these actions can then lead to a virtuous circle. Rather than moaning about costs or slow attention to problems, residents are happy – they stay longer (reducing voids) and recommend the landlord to their friends and colleagues. Word of mouth recommendation is a valuable asset, and in short supply currently in the private rented market. Investor Westrock is planning to grow a portfolio of rental apartments in the UK regions worth up to £500 million. In the last two months, the company has acquired seven sites in Portsmouth, Exeter and Crawley – all office buildings capable of being converted to residential. Westrock’s plan takes advantage of the recent easing of planning rules, which make it easier to convert redundant offices into residential. The permission only runs automatically until the second quarter of 2016, hence Westrock is looking to secure as many other suitable sites as possible, before then. 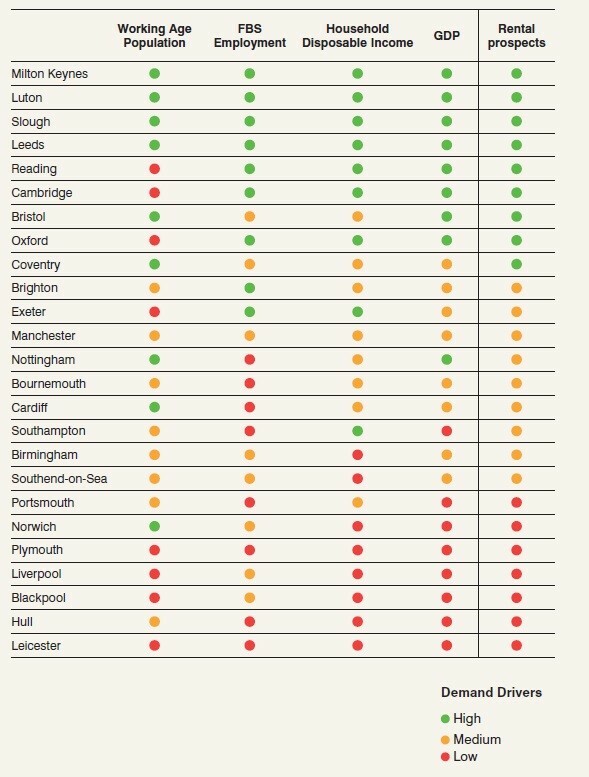 It is looking in preference in the south west, south east and in London commuter suburbs. The first fruits of Westrock’s strategy will be 60 flats available in the first phase of a conversion in central Exeter, which are due for completion late in 2014. The company expects to announce a brand for its rented homes, in the summer. Looking ahead, it believes it might be in a position to sell on the rented portfolio to an institutional investor, within a three to five year timeframe. Hong Kong investor IP Global has block purchased 121 flats in Deptford, which it will either rent to the market directly, or sell to buy-to-let investors. The flats were originally intended to form part of a rental portfolio held by developer Cathedral Group, which is undertaking the £48 million Deptford project. The scheme is next to Deptford railway station, and in an eight storey block will deliver 121 private flats, eight affordable homes, three townhouses and refurbished railway arches for commercial use. The IP Global deal will ensure Cathedral can start on the project, as development finance is now forthcoming. In February, Cathedral bought out its original joint venture partner on the project, United House. Cathedral, an established residential and mixed use developer, wants to establish its own long term private rented portfolio. According to Property Week magazine, the company is looking for up to £300 million from a funding partner, to get the portfolio moving. This is the second project in Deptford, south east London, that IP Global has invested in. The company recently bought a block of 64 flats in a scheme at Hilton’s Wharf, Deptford Creek for £30 million. The company has also recently purchased eight City apartments in a block on Lovat Lane that cost it £6 million. Sir Stelios Haji-Ioannou, the innovator behind EasyJet, is planning to enter the residential property market with EasyProperty. The new venture could involve itself in rental property, providing a new, cut-price agency service, as well as working on home sales. The venture, trailed in a report in the Telegraph newspaper, is being worked up for an expected summer 2014 launch, but the name and website have been registered. Robert Ellice, formerly with estate agency Clarke Hillyer, is working on the project. “We are going to shake up the property market to make buying, selling, renting and letting simple, quick and cost effective”, promises the website. Let’s just hope the walls don’t have to be orange.